All the leaders have two tungsten sections, one third and two thirds of the way down the length to ensure the whole leader sinks to the lake bed on a slack line. Compare them to anything else on the market and it is blatantly obvious a great deal of thought has gone into them. We have made them in 1m lengths, which is longer than the original versions. The Safe Zone principle came about through filming the State of the Art Underwater Carp Fishing films and Underwater 7 & 8. There can be no better way of learning about carp's behaviour around rigs than actually filming them in their natural environment. Every time we make a film there is no way we can show all the underwater footage that we record, it has to be edited severely just to get the films down to four hours! Sadly, this means that many of the patterns that emerge as a result of watching the fish non-stop cannot be fully shown in the films. Watching a pattern emerge is quite simply priceless, each film has shown something new but one common theme runs through them all: THE FISH KNOW THEY ARE BEING FISHED FOR! Make no mistake, the rig you are using at this very moment can be seen by the carp, and the brighter the sun and the clearer the water the more it stands out. Fortunately, competitive feeding and being lucky enough for the rig to lay right every now and again does lead to captures. However, don’t kid yourself, your rig's ability to blend into its background will affect your run rate. The less they feel they are being fished for, the more bites you will get. This totally unique experience has shown us that if we can create a 'Safe Zone' around the hook bait then we will get more bites. This is why we were the first company to sell several different colours of all our rig items so that you have the option of matching your rig to the lake bed it will be resting on. So how do we know the new Safezone leaders really do blend in? Because we actually took samples of the different types of lake bed and sent them to the manufacturers so they could colour match to some actual silk weed, gravel, silt and clay. To you and I the colours may not look right but simply drop them in on the type of lake bed we say they are suited to and watch them disappear. After significant public demand, we have even added a clear colour to compliment the range. The leader with a size-8 ring swivel on the end is best used with our inline leads, lead clips, running rigs and method feeders. 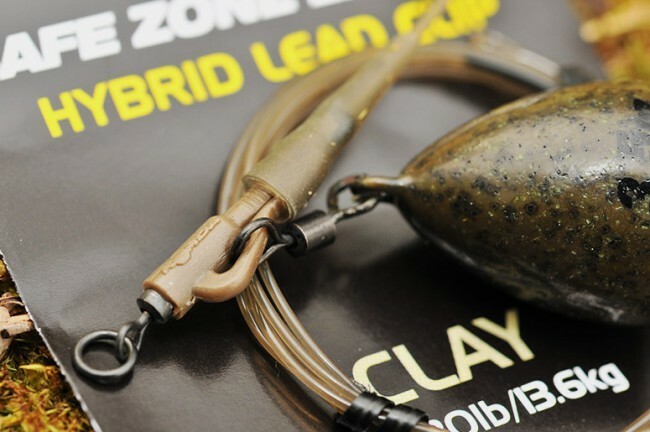 Once wet, all these types of lead system will easily slip over the tungsten collars and the fused loop at the end of the leader. When the leaders are dry, products such as inline leads and method feeders will stick to the tungsten sections and you will think they are unsafe. However, when wet they slip over them with ease and, let's face it, when underwater they'll always be moist. Secondly, there is the Hybrid Lead Clip Leader, which features the safest lead clip possible and matching Tail Rubber. Looking to buy some Carp Leaders as part of a fishing gift? If you would like some advice on purchasing Carp Leaders, simply contact our expert fishing team, giving us either an email or phone number on which to contact you and we'll get back to you right away with the best advice and prices. FREE Delivery on all Korda Carp Leaders over £100!! !